Below is the Pick 4 ticket for June 9th, 2018 at Belmont Park on Belmont Stakes Day. As always the ticket is $20 or less. Off Limits (#3, 7-2) has done her best work at a mile and adores Belmont Park’s turf course. She makes her third start off a layoff and seems to be rounding back to her best form. A Raving Beauty (#7, 5-2) gives Chad Brown a potent 1-2 punch in here. There is no telling how good she is after crushing lesser foes first time in this country. She seems to be better since removing the blinkers and adding Lasix may have been the key all along. Proctor’s Ledge (#5, 4-1) has run very well outside of Keeneland and put it all together with a nice win on Kentucky Derby Day. She has 3 wins and 1 second in her four races outside of Keeneland since adding Lasix. She is dangerous right back in this spot. Ransom the Moon (#8, 10-1) should relish a one-turn mile and can sit right behind the pace in a race that has a surprisingly little amount of speed. He will be full cranked second off the layoff and has been keeping top company against California sprinters. Bee Jersey (#10, 5-1) has turned into a monster in America since stretching out to a mile. He could get loose on the lead in here and will have an opportunity to show that he has enough class to compete with these in the lane. Mind Your Biscuits (#1, 5-2) deserves top billing in here as he is the model of consistency and class. 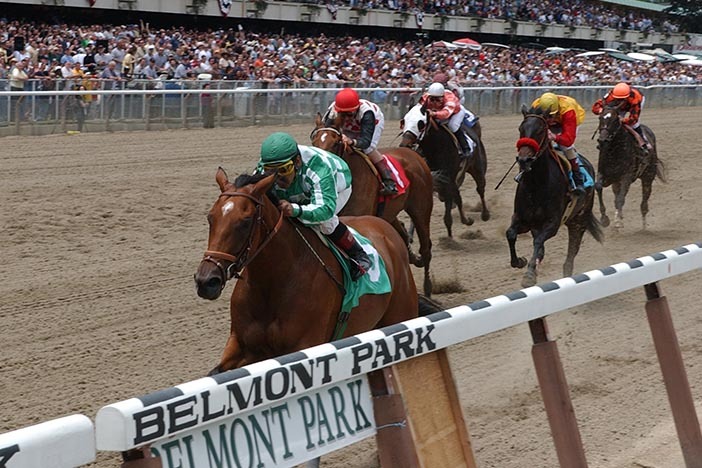 His Dubai win was breathtaking and he is proven at Belmont Park. He may be better sprinting however; and may not get the race flow he needs to win. He is a must use, but far from a cinch. Beach Patrol (#10, 5-2) always shows up with a top effort and should be more fit second off the layoff. This will be his 10th consecutive Grade 1 race and his tactical ability and class should be enough to get the job done in this highly competitive field. Alexios Komnenos (#4, 20-1) is the knockout price horse in a sequence that could otherwise be fairly chalky. He adds Lasix and picks up Florent Geroux for a trainer that won with his only recent import. He was only a neck behind the talented Churchill as a two-year-old and has sneaky good form coming into his U.S. debut. Hofburg (#4, 9-2) could be this year’s giant slayer. He has improved in every start, should enjoy the added distance and suffered a nightmare trip in the Kentucky Derby. He is the only horse in the race with enough upside to defeat Justify and has been freshened for this spot. Justify (#1, 4-5) has done nothing wrong in his brilliant career and will become the 13th Triple Crown Champion unless he regresses. He has the tactical speed to sit a great trip and is bred to handle the demanding Belmont distance. This will be his 6th race in a short amount of time and his margin of victory has gotten smaller in each and every race. One has to wonder if it will all catch up to him at some point, but there is no denying his immense talent.